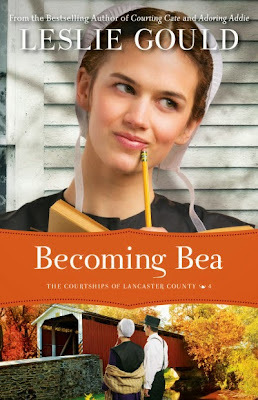 I recently had the chance to read the latest book from Leslie Gould - Becoming Bea. This book is the 4th in The Courtships of Lancaster County, but the first that I read. Jumping in in the middle of the series was not an issue, as the author did a great job of providing back story as needed. Bea and Ben had known each other since they were in school and as scholars, there was always a competition between them. They had courted briefly, but something had brought that to an end. This really hit home for me, as there was a guy that I went to school with that I was always competing with and even had a crush on at one point. I never dated the guy from school, but used to wonder what if. I really like how the author developed the lead characters because it made them easy to relate to. Like many young adults, finding herself in a new environment helps Bea learn things that she didn't know about herself and overcome fears that she had. This learning helps her become a more confident and slower to react to things around her. Of course, if you want to find out more about Bea, what she learns and what happens, reading the story is the best way. As with much of the Amish fiction that I have read, the fact that the characters are Amish seems to be more of a component of the background or scenery, nuances in the story. The story transcends their faith and could be about anyone, anywhere. I enjoyed reading this book by Leslie Gould and plan to read her other books - perhaps starting with the earlier books in the series, to learn even more about some of the characters that I met in Becoming Bea. You can find more reviews and information on the blog tour landing page.